Vollrath, most well-known for its smallwares and tabletop items, wants you to know that they are so much more than that. That is why they created this remarkable traveling showroom to teach and inform everyone of all the great things they have to offer. 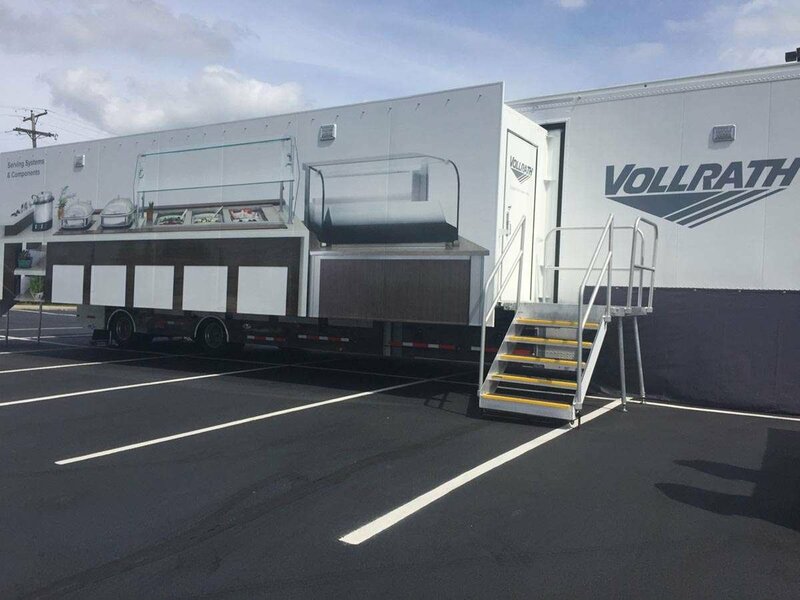 On July 26, the Dean Supply crew had the opportunity to tour the Vollrath Traveling Serving Systems Showroom truck when it stopped in Cleveland. We were thrilled to be able to take a tour of their info-filled showroom truck and get an in-depth look at each product. Crystal, our knowledgeable tour guide, gave us the inside scoop on the most innovative new products that are great for not only the foodservice industry, but also schools, universities, stadiums and so much more. Generally, what trends has Vollrath seen becoming more popular over the last 6 month (in terms of smallwares, tabletop accessories, restaurant supply…)? Versatility is becoming a large factor in all foodservice equipment lines. An example is the Cubic Display by Vollrath. It is hugely popular because it is so versatile and can be molded to fit into any environment, which is what every catering company needs out of a food table display. Julie and Teresa said individual control and customization are also becoming a common theme among their product lines. Customers need items that help them stand out from the competition and get tasks done in unique and versatile ways. How do they stay up to date on new trends and get ideas for new products? Vollrath stays up to date by having employees out in the field gaining insight and knowledge from professionals in the industry. The information is communicated from the field back to the corporate offices where it is utilized in various departments. Trade shows are also a great resource for staying on top of trends and getting ideas for new products. Any advice for someone who is looking to make the leap and invest in a new, more advanced piece of equipment? Ask questions. Knowledge is power, so the more you know, the more confident you will be in making the right decision for your organization. Julie and Teresa suggested partnering with a company that can help you get everything you need from the ground up. The less shopping around you are doing, the more you can focus on other aspects of business. After chatting with the Vollrath experts, we boarded the showroom truck to start the tour! We learned a lot about the different equipment pieces and service options that are available, and we can’t wait to share them with you. According to a recent study, 80% of all infections are caused by touch. So it’s no surprise that there was a strong need for a better solution for restaurants, gas stations, coffee shops, food trucks and other self-service establishments to dispense lids and cups to guests. With the Vollrath Lid Saver 2 technology, you can provide quicker service without having to worry about maintaining sanitary practices. The Lid Saver is expertly designed to dispense one lid at a time. So guests will not have to touch any other lids, which protects the rest from dirt, germs and other contaminants. It is not only effortless to use, but it is also equally as easy to refill. There is no complicated process of taking the contraction apart, refilling, and putting it back together. All you have to do is push the lids up the front and snap the lid back on. With many customizable options, you are sure to get exactly what you need to fit perfectly into your foodservice establishment and cut down on lid waste by up to 30%. 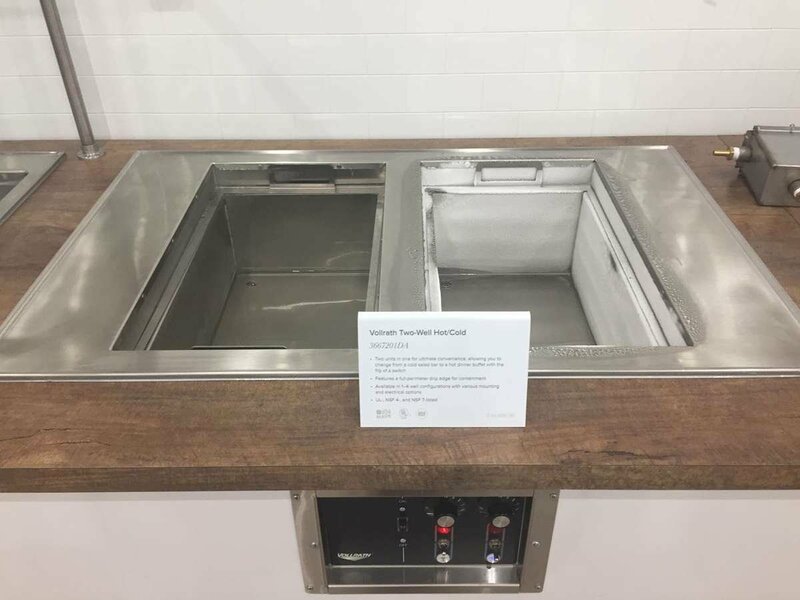 If you are looking for the ultimate versatility and convenience to serve cold salads and hot entrees, the Vollrath Two Well Hot/Cold Drop In is for you. 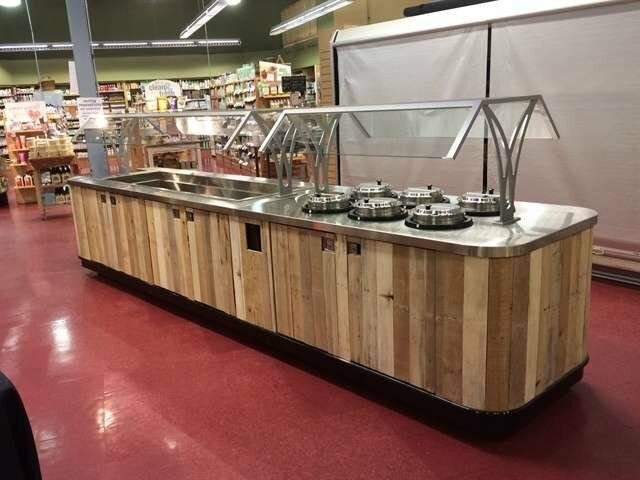 With the ability to switch from hot to cold with just the flip of a switch, you can use the individually controlled wells to go from serving a cold lunch bar to a hot dinner bar with less hassle. The toggle switch has convenient red and blue lights for easy visualization, and it only takes 45 minutes to an hour for the well to reach the proper temperature. Vollrath is unique in the type of insulation they use to help provide maximum performance. Instead of using a fiberglass insulation that can’t withstand moisture, they use a high-density polyurethane foam surrounding the exterior wall for ultimate performance and energy savings. The double foam insulation along the inside wall between the wells ensures the temperature will stay contained. When you don’t have time, energy or money to waste, the Vollrath Two Well Hot/Cold Drop In is for you. This innovative soup crock has the technology you need to serve soup, sauces, mac and cheese, and so much more at your foodservice establishment. Whether you have a self-service station or not, the induction heat will allow you to increase yield to 90-95%. With the regular soups crocks you see at grocery stores and restaurants, the yield is 65-75% of the whole crock since the last few servings are typically burned or don’t taste as fresh because of the varying temperatures throughout the day. The induction heat means no water is required, providing better temperature control and faster retherm times. So you can place cold foods into the crock, and it will get it up to the correct temperature and keep it there. The Mirage Induction Rethermalizer uses advanced technology, so all your employee will have to do is stir the pot every once in a while. 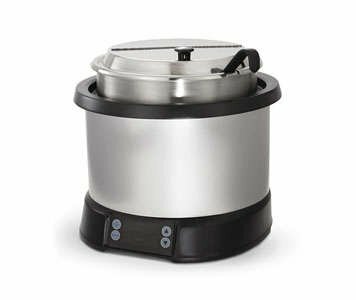 Vollrath takes the guesswork out of knowing when to redistribute heat by monitoring soup vessel temperature at all times. When the temperature varies, and the crock needs stirring, a light will come on to remind operators action is required. So if you operate a foodservice establishment that maintains a soup crock and are wondering if there was a better way to keep it at the proper temperature all day, there is - The Mirage Induction Rethermalizer. Vollrath wants you to know that they are about more than just smallwares and large equipment pieces. They want you to know they have the ability to customize just about anything you may need. From kiosks, serving lines, retail merchandising units, and mobile carts, if you can dream it, they can help you design the exact set up you need to be successful. This is what makes Vollrath a unique distributor for Dean Supply to work with. We work with our customers and Vollrath to create exactly what you need in one stop; so there is no doubt that it will all work seamlessly together without losing visual appeal. 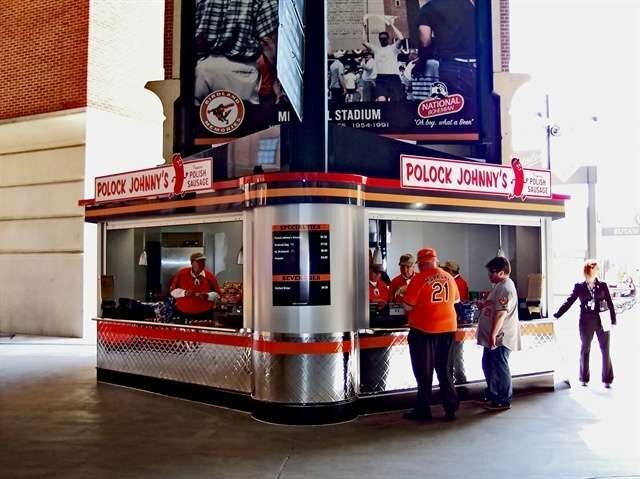 Whether you are a part of a mall, stadium/arena, hospital, supermarket, theme park or college, Vollrath can help you design a foodservice or retail service solution to help you maximize brand awareness and profitability. 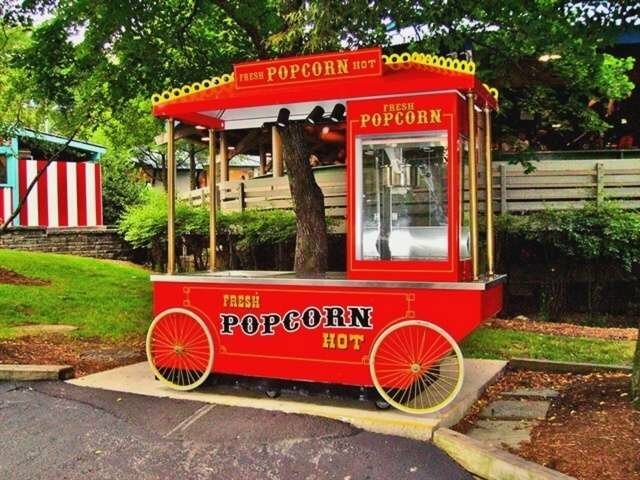 With their unique kiosk, mobile carts, and retail merchandising units, you will be able to bring your products directly to your customers. This is a great opportunity to get your food or products right where you need it, whether you want to have a pop-up shop at a fair or festival or want to add auxiliary services to your current establishment. Kiosks: If you are looking for a way to expand service offerings but keeping expenses and time spent to a minimum, a kiosk may be your solution. Vollrath offers completely customizable kiosk creation that will be specially built to fit your needs. Combining custom paint and high-resolution vinyl graphics, you can build a specific look to tell your story. Designed for fixed settings, this is a great option for foodservice and retail vendors to expand services into shopping malls, airports, hospitals, stadiums and theme parks. Serving Lines: Whether you need a long singular line or a more modular design, Vollrath will work with you to create the perfect buffet or full-service design for your unique space. When you need to efficiently serve a crowd at a school. university, hospital or supermarket, you will get the exact design to fit your needs. 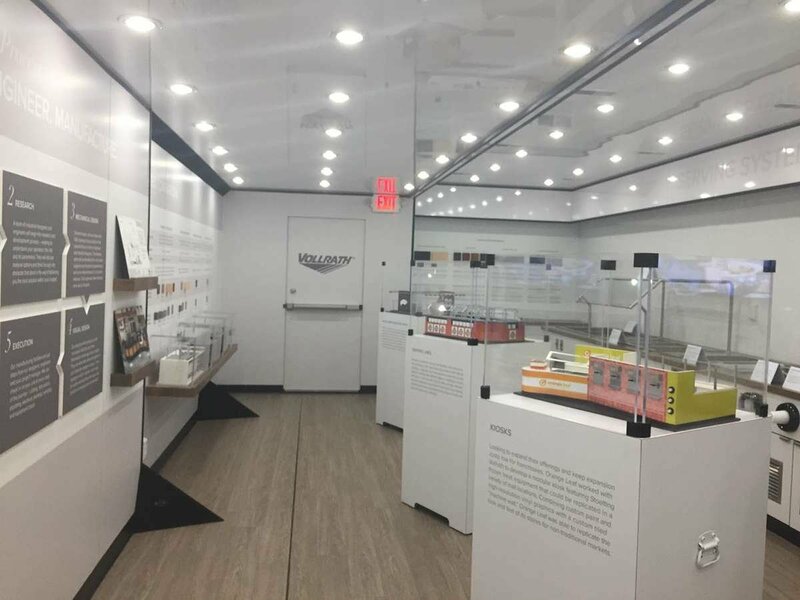 Retail Merchandising Units: When you need a little more space and flexibility than a kiosk can offer, you can upgrade to a fully customizable retail merchandising unit. 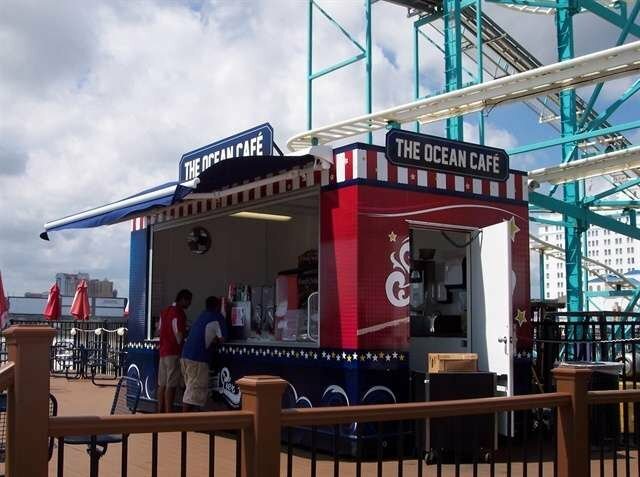 They are designed to be semi-permanent so they work great for pop-up foodservice establishments and merchandise shops. They have their own floor and can be designed in the unique way to perfectly compliment your products and services. Carts: Carts are mobile, self-contained and flexible. When you want to expand your foodservice offerings without a huge commitment, this is the way to go. You can use the creative freedom to provide auxiliary services at your school, university, stadium, hospital or airport. We love having the opportunity to learn more about our suppliers and all that they have to offer. It helps us to grow and learn how to better serve our customers. No matter what changes you have in mind for your foodservice establishment, Vollrath will help you create an attractive and profitable solution that will fit your unique needs. If you have a want or need to provide auxiliary services at your current establishment or if you're wanting to try something completely new, you will have a knowledgeable and trained staff at your disposable to make any dream, on any budget, a reality. Are you interested in hearing more about Vollrath and the products you read about here? Contact us today! We would be happy to assist you.